FoamPro offers the ultimate proportioning system for your new or retrofit apparatus. Our flow-based, microprocessor-controlled technology allows concentrate to be delivered on demand. By injecting into the discharge side, proportioning performance is not affected by external factors such as nozzle, length of hose lay, nozzle elevation or incoming pressure to the water pump. Full fire pump discharge performance is delivered to the outlet because the flowmeter doesn’t restrict water flow. No other system operates as easily and accurately as FoamPro. At the push of a button or flip of a switch, the system automatically reads water flow and injects concentrate: from 0.1% to 10.0%. 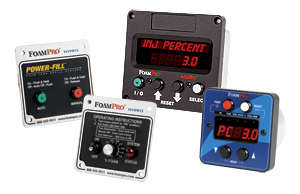 Unlike other proportioning technologies, FoamPro’s patented pump control assures unmatched accuracy across the full performance range, saving concentrate and dollars. The Power-Fill is an electronically-controlled, pre-plumbed, self-priming, concentrate refill system that will save you time and increase the safety of your firefighters. With the simple push of a button or switch, they quickly reload on-board foam cells, without messy spillage. Most importantly, Power-Fill safely eliminates awkward and strenuous lifting of concentrate containers and allows easier transfer from totes. These systems will fill even the largest tanks quickly and efficiently, at up to 18 gallons per minute, depending on viscosity. The non-corrosive pump, with high-drafting capabilities, is compatible with all concentrates and viscosities currently in use.